Just before the holidays get into full swing, Viber is rolling out an app update featuring improved emoticons, recorded video messages, and animated GIFs. Once upon a time you needed two free messaging apps on your phone: WhatsApp for free text messages worldwide, and Viber for free voice calls. But over the years those two apps (and many others) have become more and more similar—though with unique features available on each. Now, Viber is upping its chat game with a few new additions that feel more like the messaging app is playing catch-up with the competition rather than breaking new ground. Viber’s new recorded video feature. 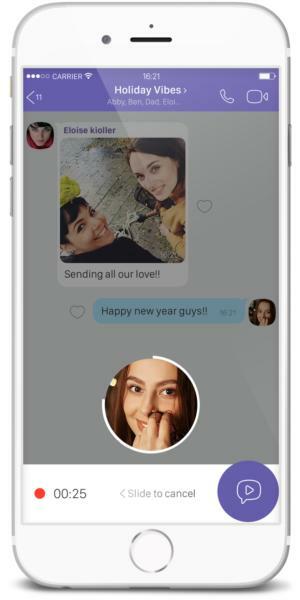 The first new feature: recorded video messages. Viber’s new video messages appear inside the text chat window as a small circular video and are limited to 30 seconds each. Similar to WhatsApp’s recorded audio feature, you press and hold Viber’s video chat button while inside a chat screen. Once you let go of the video button your message is automatically sent, or you can slide left to cancel. Note that Viber’s quick video messages lack audio, however. This means they’re more like extended animated GIFs than anything else. Speaking of GIFs, Viber is adding what it calls chat extensions to its messaging feature. This is similar to Facebook Messenger’s ability to add information from third-party services. Viber’s chat extensions let you quickly add animated GIFs from Giphy and information from sites like TheMovieDB and Wikipedia, as well as stickers. To access the new chat extensions feature, tap on the “@” symbol in the text entry area and scroll through the various options. Viber says it will continue to add more third-party services to the extensions feature in the future. Those are the two big new additions to the new Viber. The app is also getting redesigned emoticons that the company says have a “flat, colorful aesthetic.” The Viber update is rolling out now to users on Android and iOS.